Getting started in investing often presents a chicken or egg scenario. Investment companies don't make it easy on new investors because they charge fees on most transactions and they have high minimum purchase requirements for many mutual funds. How can you start investing if you have very little money to begin with? One of the tough things about investing when you have a small amount of money is that fees often take out a sizable chunk of your purchasing power. For example, if you want to buy two shares of Coca-Cola for $100 total, eTrade charges $6.95 for each trade. That means you're losing nearly 7 percent of your money right off the bat. Fortunately, many discount brokerage firms, including eTrade, Fidelity Investments, and others, offer many investments without a commission. Often, these commission-free investments are exchange-traded funds that allow you to gain ownership of a specific stock sector or class. There is a perception out there that the best-performing mutual funds are only open to people willing to invest tens of thousands of dollars. But this isn't necessarily true. Most major mutual fund companies offer scores of great funds that are available to people with relatively small minimums. Charles Schwab has several funds that allow you to get started for $100, and there are others out there with minimums of under $1,000. Keep in mind, too, that even a minimum of $3,000 could be in reach for you with the right kind of planning. If you can put aside $250 a month, an entire world of mutual funds will be available to you by the end of the year. Believe it or not, there are now ways to buy less than a full share of stock, using smartphone apps. Stockpile allows you to spend as little as $5 and buy fractional shares of more than 1,000 ETFs and mutual funds. Another app called Divy lets you buy partial shares for $10, with commissions of just 10 cents; and Stash has 40 ETFs available for a minimum investment of just $5. So for the price of just a couple cups of coffee, you can get started investing. And it's a great way to learn the basics of the stock market with little risk. Another new area of investing comes from digital platforms that allow you to own shares, but through a monthly subscription model. Motif is an online investment adviser that charges as little as $9.95 per month to automatically invest your money into a personalized portfolio centered around a theme, such as "healthy and tasty" (companies that sell organic and farm-raised food). Folio Investing is a competitor that charges $29 per month and allows unlimited trading into as many portfolios as the investor wants. Just because a stock is trading at a low price doesn't mean it's not a solid purchase. There are many good companies out there that consistently trade at under $15. In some cases, these companies have simply performed stock splits in order to give shareholders more shares at lower prices. (Companies will often do this to attract new investors.) In other cases, shares are low due to some bad news, but may be due for a rebound. Under Armour is one example of a big company with shares available for cheap; the athletic apparel company has struggled recently, with shares falling below $13, but shares were has high as $29 just one year ago. If you don't have a lot of money to invest, consider looking into shares of companies with low share prices. Just be sure to research the company's financials to see if it's a good investment. If you don't have money to hit a minimum investment requirement, consider taking a two-step approach. 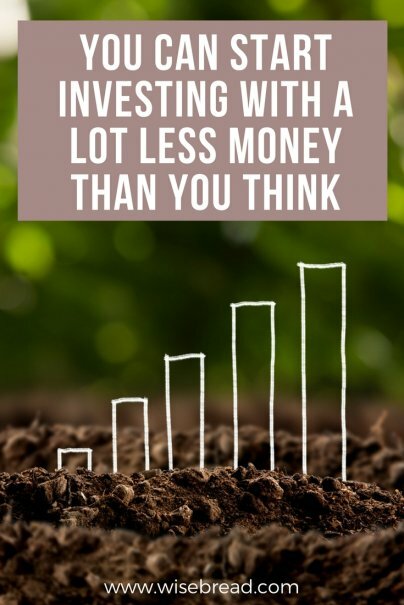 Try to set aside as much money as you can into a special savings account, then once that account has accrued enough, go ahead and invest in that mutual fund. So for example, if you need $3,000 to invest in a certain Vanguard mutual fund, work to set aside $250 a month and see if you can accrue enough to get started investing by the end of the year.